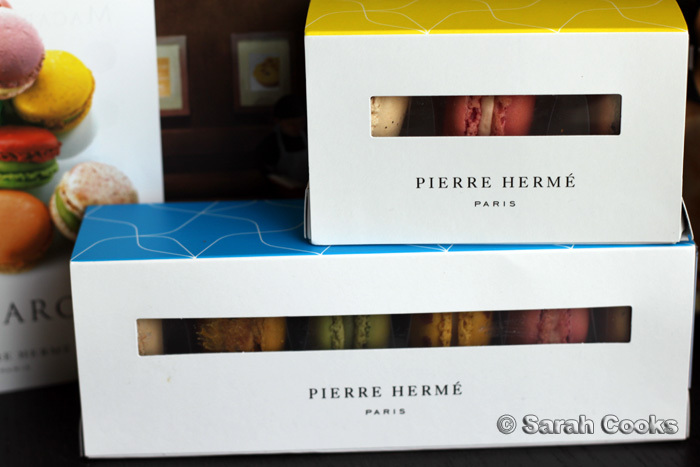 My parents recently went on holiday to Tokyo, and when they asked if there was anything I wanted them to bring back, I thought of one thing, and one thing only: Pierre Hermé macarons! I thought they'd just buy one box, but they came back with a massive stash of awesome goodies! My dad picked these all up at the Isetan foodhall in Tokyo, and painstakingly hand-carried them all back to Melbourne. Thank-you Dad!!!!! 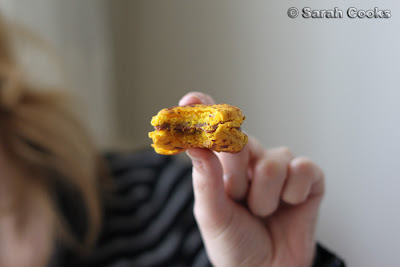 Now that we've eaten our way through most of them, (it's a tough life) let's have a look! 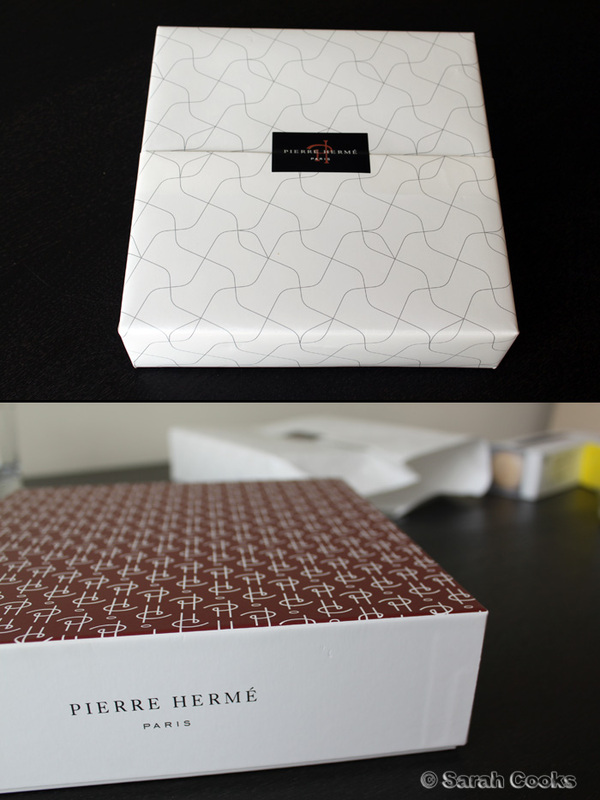 First, the pretty packaging! 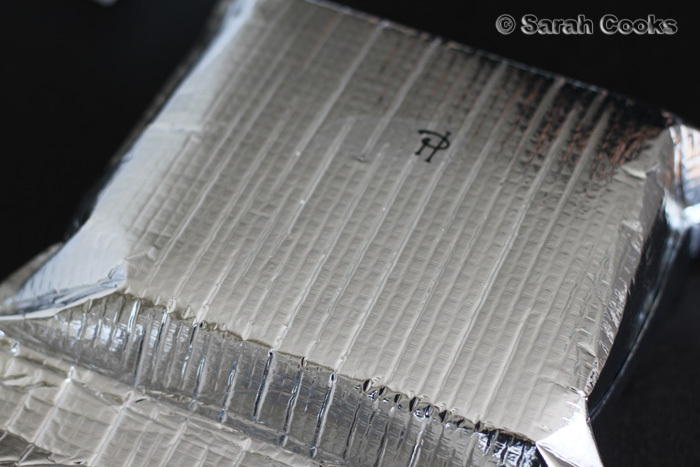 I love that Japanese shops pay so much attention to their packaging! The last time I had Pierre Hermé macarons, which my friend Clarice had brought from Paris to London to share, they were just placed into a box with a layer of tissue paper inside. It was so much fun opening up the different packets! And what's inside? Les Fours-Demi Secs. More specifically, madeleines and financiers. 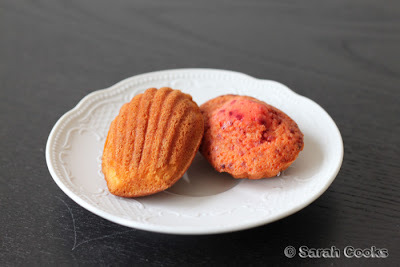 On the left we have a vanilla madeleine (or "madereenu byaniiru" in the Japanese pronunciation, hehe! 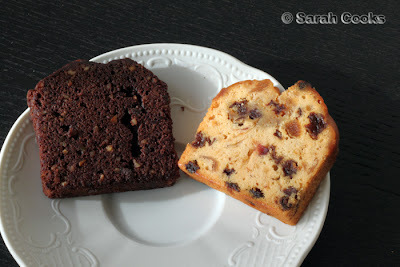 ), and on the left is an Ispahan! 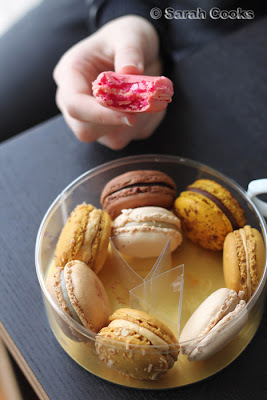 Fellow Pierre fans will know that the Ispahan is one of Pierre's signature entremets - a giant pink macaron filled with fresh raspberries, rose buttercream, and lychees. 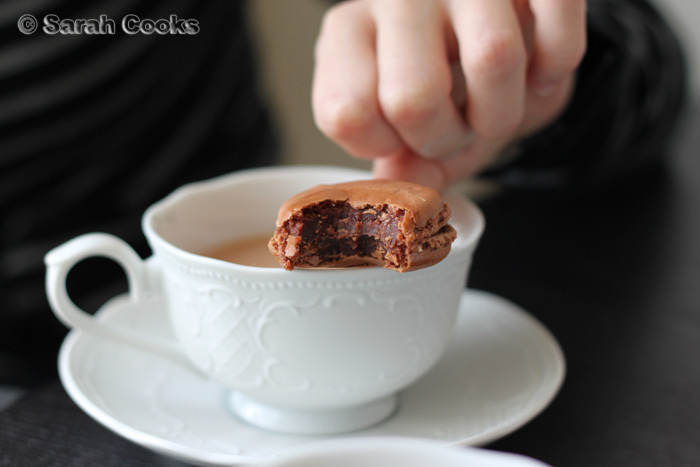 And here it is in madeleine form. It had tiny bits of raspberries and crystalised roses inside, with a faint rose taste all the way through. Wonderful. 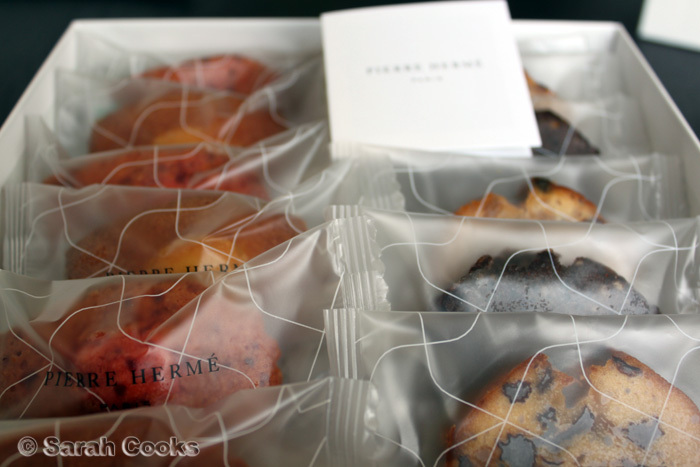 Because they were sealed, they lasted quite well; although I'm sure they'd be more delicious fresh out of the oven! 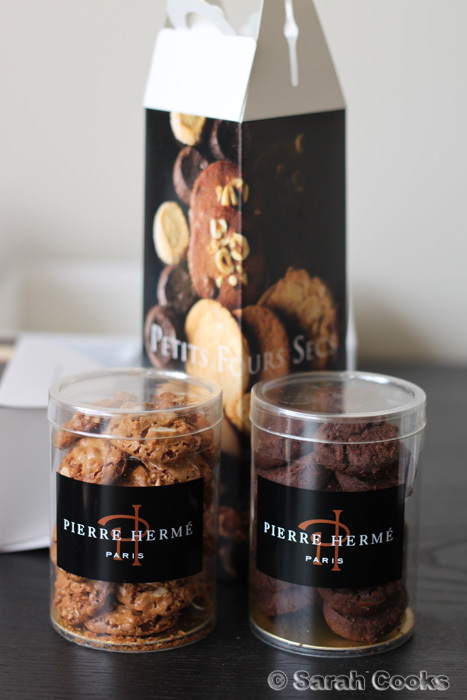 Next up we have the Petits Fours Secs, AKA biscuits! There are hazelnut croquants and chocolate sablés. 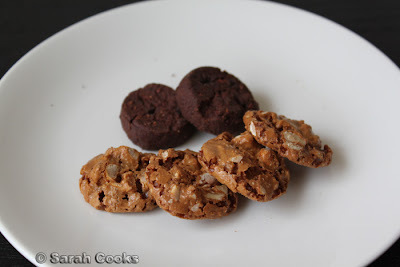 The croquants are like little meringues with hazelnuts and coffee flavouring, and the sablés are super-rich nuggets of chocolate shortbread, filled with tiny pieces of dark chococlate, and crunchy things that I couldn't identify at first. Then I read the ingredients list, and it clicked: raspberries! I'm not sure if it's raspberry pureé or jam or whatever, but they were faaabulous! Raspberry and dark chocolate is a combination made in heaven. And finally, what you're all here for... 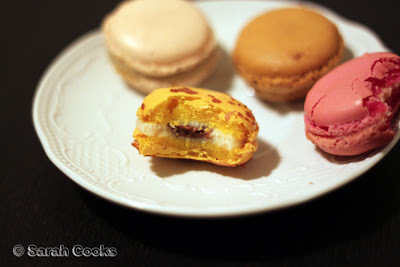 macarons!!! I was super-lucky; Dad bought us a 10-pack, a 6-pack and a 3-pack! How pretty is the box! 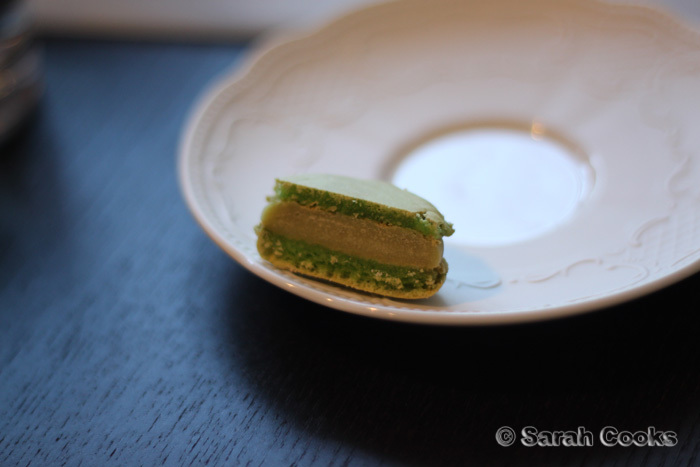 And at the bottom of the picture you can see the tantalising macaron-window, hehe. Each of the boxes had a small hidden section underneath the macarons, which had tiny ice-packs in them. And with the ice-packs, then their macaron-refrigerating duties are over, you can rip them open and wash your hands with the liquid inside. Such ingenuity! 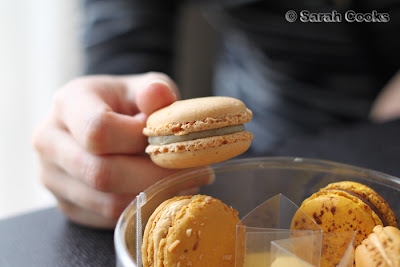 You'll see that in this 10-pack, there are 2 Mogador, or chocolate-passionfruit macarons. They're passionfruit shells, dusted with cocoa and filled with milk chocolate ganache. These are my favourite flavour in the Whole Wide World, ever. (Discovered back in '06, and dreamt about ever since). I think the dusting of cocoa on the shell really makes the difference. Of the three pale ones in the box, one was vanilla and two were green-tea/jasmine. Flower flavours can often be strong, but this one was subtle and light, with the flavour and aroma fluttering through as a gentle aftertaste. Wonderful. Next up we have a rather unusual one - coconut on the outside of the shell, a deep burnt caramel filling, with a small square of apricot gelée in the centre. The lemon/hazelnut macaron was one of the best of the bunch! And such an unusual flavour combo. 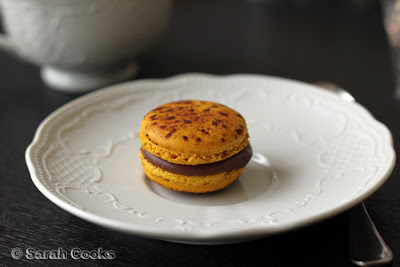 The shell was lemon-flavoured, with crunchy little hazelnut-flavoured things on the outside (apologies for the complete ignorance of the French pastry terms), a sharp lemon-ganache, and a small blob of choc-hazelnut cream in the centre. The choc-hazelnut cream was rather like the filling in a Guylian shell - sweet, creamy and with a bit of texture from the ground hazelnuts. Sooo delicious! 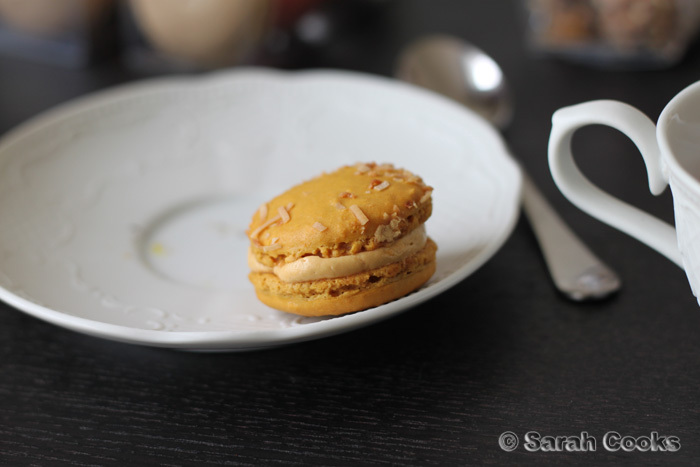 A massive thank-you to my Dad for such macaron awesomeness! Oh babe you need to come to London (or Paris!) and we can go eat PH to our hearts content! I love the jasmine macaron... and also the salted caramel.. nom nom! ENVIOUS!. thats a LOT to carry by hand. kudos to ur dad hehe. when is PH gonna open one in MELB?? sigh. 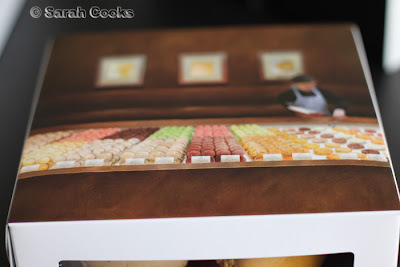 looks like quite a few boxes, how many macarons were there in total? lucky girl! 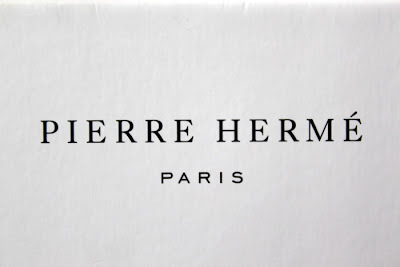 I need to get myself some... by getting a holiday in Paris! Jealous jealous jealous! They look amazing and I love how perfectly packaged they were! You're dad is THE MAN! I'm sure you know it, but you are one lucky girl to have a dad like that. He gets some serious points for that! Oh my goodness! What an amazing feast! Total Sugar rush! I love macarons as well. Pure heaven. Tried to make my own a few times, but they aren't the same. Thanks for your amazing blog, I'm inspired to Nigella's Pork Knuckles this weekend! Wahhh Sarah, excellent'e!!! I was waiting anxiously to get home to access your blog, particularly the post on macarons. Ooooh la la!! 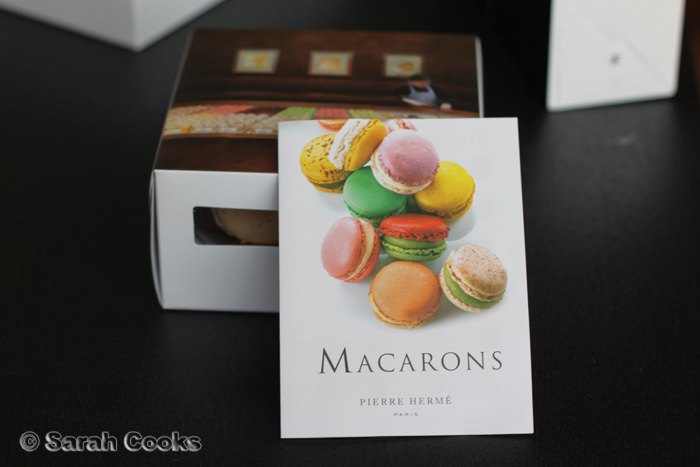 Those macarons look AMAZING! 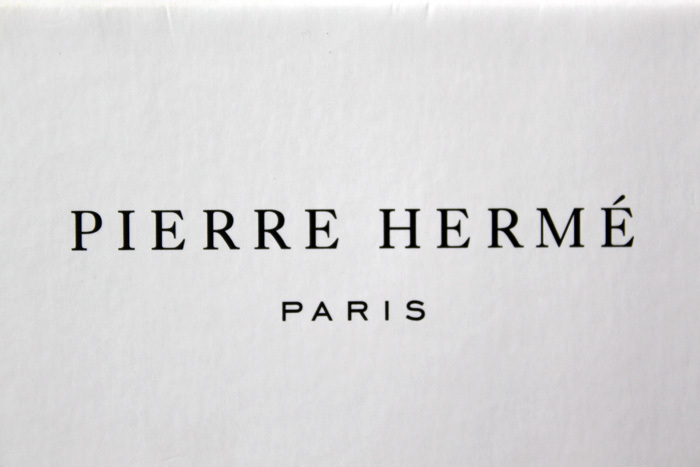 I've never had macarons or heard of Pierre Herme, but after reading your blog I want it, all of it. I look forward to reading more after stumbling across your blog searching for a Nigella (the goddess of the kitchen) Lawson recipe. Oh my gawd! Your dad rocks! Oh wow! 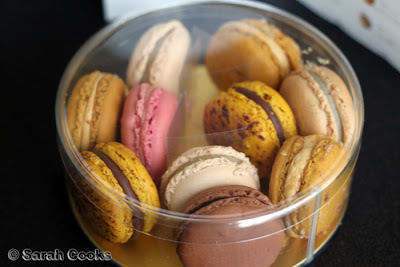 How gorgeous are these macarons? And the selection! Your dad knows you at heart! 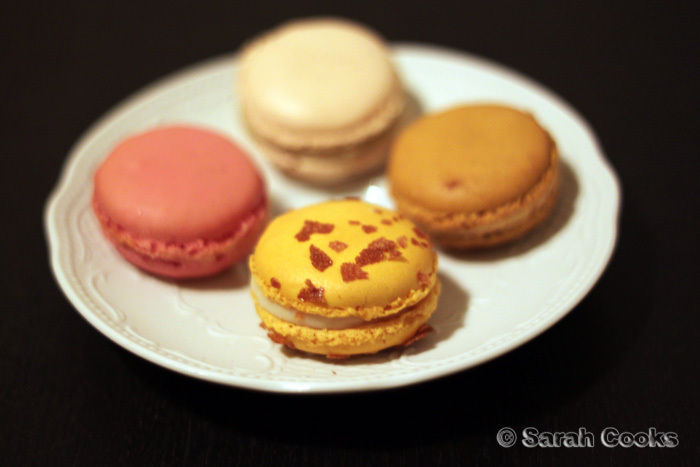 ;) I love the shade of that gorgeous rose water macaron with the madeline too. It looks like a wonderful feast!